Radu Savopol is the man behind the 5 to Go chain of mini coffee shop franchises sweeping Bucharest, Romania and soon Europe with its stunningly simple business format of good coffee, at an affordable price and available in convenient locations just about everywhere. OZB caught up with Radu for a double espresso (5 lei) and a chat. You’ve talked in the past about how influential your mariner/artist grandfather was over all your family, tell us about him and what you learned from him and are there any of his paintings that you particularly like? Yes, my grandfather was an emblem for me and for our family, he was a commander in the royal navy, after this he continued working as a painter, painting mostly sea and marine landscapes! I have some paintings of his that I love, one that my father received when I was born, a gorgeous, soothing and colourful marine scene! When you were growing up and as a younger man what were your main aspirations? What were the things that drove you and where did your artistry and creativity fit in with these aspirations? I spent my first 7 years with my grandparents’. I grew up in the Rahova and Fundeni neighbourhoods of Bucharest and this is something that has proved to be very useful through my life! I was always ambitious and usually succeeded with my plans, no matter if that was a game that had to be completed, or if it was getting something that I wanted. I did small jobs through the holidays to make the money to afford things. There was a distinct atmosphere in my family–I grew up amongst artists and cultured people–and I think this had a lot to do with developing my taste for creativity and my appreciation of beauty. I’ve always wanted to do things slightly differently! There’s a modernity that’s matched only by the functionality of 5 to Go. How emblematic of modern Romania do you think 5 to Go is? 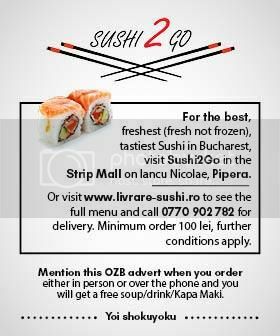 What do you think the success of 5 to Go says about today’s Romania both in terms of the customer and the franchisees? 5 to Go is a very functional business and it’s absolutely necessary for those who wake up in the morning and want to go to work, school, college with a smile on their face and a good coffee in their hand, our coffee that is served as fast as possible! This functionality has become a landmark in the food and beverage industry within the last 3 years. Many similar businesses are referencing 5 to Go’s design – our functionality, products and our overall concept! Romania needed a fresh brand, a Romanian brand with people being directly involved and a business approach addressing the business areas in town. Franchisees must have a feel for their business but they also get a great backing from us starting at the planning stage and through to the implementation, the location etc. Clients are happy, they love the concept, they enjoy the openness and the convenience and they enjoy the characters that are on the glasses but I think they especially enjoy the quality-price ratio! I read that parents are electing to buy a 5 to Go franchise for their kids rather than cover their college fees (can you give us an example please? ), while fast tracked corporate people are sacking their jobs to buy a a 5 to Go franchise, such is the appeal of running their own business and the appeal of such a simple yet tried and tested and highly effective franchise. What do you think are the factors behind this (personal and macro with particular focus on Romania and Romanians today)? Yes, among our first franchisees were parents who bought the franchise for their 19-year-old son to take charge so that he could see real life, the good and the bad. This family are still franchisees, the father went on to buy a franchise for each of his 3 children! There are other examples here in Bucharest but also in Brașov that I am very proud of! We also have young people who have quit their high flying jobs in a multinational, have taken the bull by the horns and have bought their own franchise and are now doing things really well. They understand the franchise and they understand the benefits of being part of a chain of cafes like ours and they know about business here in Romania. Was there a key point when you realised that 5 to Go wasn’t just going to succeed but it was going to fly and expand very quickly? If yes when was this and how did you feel then? Any comments on the key elements behind the success of 5 to Go? I still do not think that way, I believe that if you respect your vision, mentors, partners and suppliers you have the whole framework to make your business a success! I had moments of joy like when I was won awards and it was like wow! But the next day I went straight back to work again like nothing had happened. Today there are 80 locations where you can find 5 to Go. In the back office there are people who work every day from 07.00 into to the evening and are connected to everything that happens behind this 5 to Go phenomenon. And I have sacrificed much of my personal life, but that matters less today. Going forward you now have franchises in Poland and in the Czech Republic, are there plans to roll out further and further afield? Additionally, I understand that you are now looking at doing something similar but with a bar—Dialog—tell us about the idea behind this from the point of view of both customers and potential franchisees. I have not yet completed the Poland developments, but there are many ongoing discussions, it is an important step and I do not want to get it wrong. Last week I was at a coffee conference in London and I had the first discussions about a partnership with an operator from the UK. Dialogue Social Bar is a 5 to Go flagship. This is a place where we can show that we can do something different and on another level. It is a place we found when we were looking for locations for 5 to Go!It’s already ready for franchising. Dialog is a concept – I want to bring new places to the surface and create a network of places to socialize! As a successful businessman entrepreneur what do you think about the balance between creative thinking and the bottom line, bean counting, accountancy element? How do you balance the two? At first it was harder, now I’m 50-50, creativity is my advantage, it’s what makes me never bored in this business, whether I create interior design or graphic design, or marketing campaigns. Figures are the basis of this business and I allocate weekly time to find new methods and new high yield products for the franchise! Monday’s weekly meeting is divided 50/50 creativity and financial! There’s an audacity to 5 to Go, a playful simplicity that’s almost cheeky and it’s fresh and refreshing to see things simplified as much as possible in an age of over-complications. Can you outline your thinking on this? What would be your ideal day, what do you like to do when you are not working, how do you occupy yourself when you are not working? Nespresso: Innovation and revolution, what else ?